I was talking to my mother the other day and she said that Uncle Joe brought her some vegetables from his garden. "Marone a mia, so many vegetables, I had to make Giambotta." Sometimes you just have to make Giambotta. The name conjures up memories of walking up the stairs to my grandmother's apartment in the summer and smelling everyone's version of Giambotta. Everyone one who lived in her house, that was divided up into 5 apartments, was from Italy. They all had their special way of making this dish: some heavy with garlic, some all vegetables, some with beans, some with meat. It all depended on what region of Italy you were from, and what vegetables were ripe in your garden. Here is my version of Giambotta. I made mine with cannelloni beans in order to make it a complete vegetarian meal. I also make it with sausage because my father's family are sausage manufactures so sausage usually finds it way it every dish on occasion. This recipe is truly a guide I invite you to discover your own Giambotta with whatever vegetables or leftover meat you have... experiment and enjoy you really can't make a mistake with this dish. 1) If you are including sausage sauté it in a large skillet and remove it to a large bowl. Pour the white wine over the brown that is left from cooking the sausage and turn it to high. Scrape the brown and reduce the wine until it is syrupy. This is called "deglazing." You get a lot of good flavor from the meat this way. Pour the liquid over the sitting sausage. 2) Heat the skillet on medium high and add 1 tablespoon of olive oil at a time as needed to sauté the vegetables. 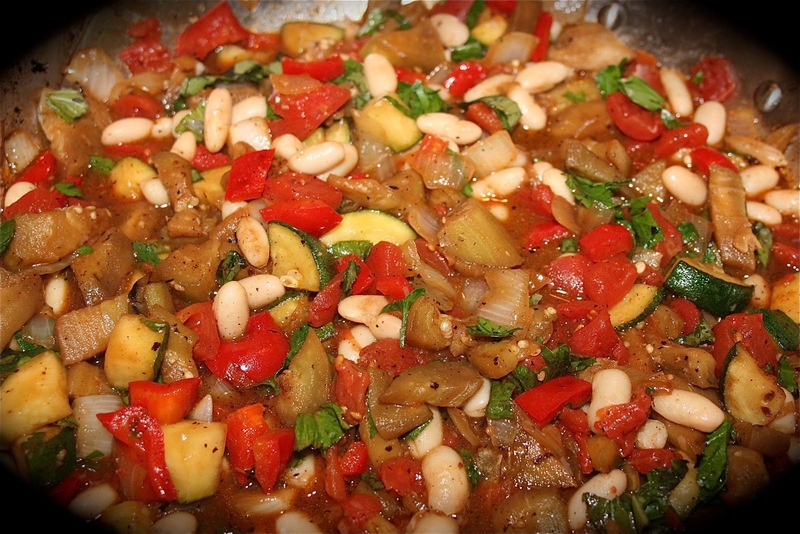 Cook them in this order hardest to softest, most flavorful to least: onions, garlic, peppers, zucchini, and then the eggplant. Salt each vegetable as you cook it, and remove it from the skillet (add it to the sausage bowl) so you have room to brown each vegetable. Note on eggplant: the longer thinner ones have less seeds, and it is best not to salt eggplant until it browns or it will give off too much liquid. If you are not using meat now is the time to add the wine and deglaze the pan. Leave the reduced wine in the skillet. 3) After you have cooked all of the vegetable return them to the skillet. Pour in beans, and tomatoes. Stir and cook on low heat. Add basil and parsley last. Taste and then add some salt and pepper. It is nice to let this sit for a hour or two before serving but it is not necessary. Serve with rustic Italian bread or over polenta for a gluten free alternative. I am unplugged this week and apologize if I do not respond to your comments. Dianne, thanks for hosting. Some times you just have to be "unplugged" and take time for yourself. Your stew sounds so flavorful, I can almost smell it cooking on the stove. Have a great weekend! I had to pin this! We love everything in this stew! The stew sounds delicious! Hope you are enjoying the rest of your summer! I can't wait to try your Italian Summer Stew, it looks delicious. I am sharing my Dairy Free Crisp Cole Slaw for the party today. Hope you have a great holiday week end and thanks for hosting! I've never had giambotta, but it looks like my kind of dish. Thank you for sharing it. Thank you, also, for hosting today! Thanks for hosting! this week, i shared my Beet and Pesto Napoleon! They're Gluten/Grain Free, Vegan and Specific Carb Diet SCD Friendly! Have a great weekend! Thanks for hosting - have a lovely weekend! Your stew sounds fantastic and I would definitely add the sausage. Thank you for hosting. I hope you have a great weekend. I visited our local farmers market for homegrown tomatoes and linked a "tomato sandwich with a pedigree." Your giambotta looks wonderful. I'm going to have to add it to my Must-Make list. This week I'm sharing two recipes - Crustless Quinoa Veggie Pie, an egg based dish that comes together quickly and can be eaten with any meal of the day. Plus Homemade Coconut Granola & Recipe Roundup. Made with gluten free oats, a fat-free, sugar-free granola that is kid approved, my grandson loves it. Your summer stew looks delicious & flavorful, full of colors. Thank you for hosting. Have a great weekend! Yum! This stew looks & sounds wonderful, Diane! have fun being "unplugged". Thanks for hosting. This looks great! Thanks so much for sharing at Must Try Monday! This is an awesome stew, it is that time of the year when we will start looking for those special recipes, I will be trying this one. Hope you are having a fabulous weekend and thank you so much for sharing with Full Plate Thursday. Oh this looks so good! Hope you are having a great weekend. This sounds delicious - I like both the vegetarian and the sausage versions! It's a lovely colourful dish as well. Thank you it is truly visually and taste wise satisfying. I hope you get a chance to try it. This looks scrumptious! I love stew and can always use a new recipe. I can’t wait to try this. Thanks so much for linking up last week to Creative Thursday. Can’t wait to see what you have for this week’s party! Have a great week.